To make the world better, give and forgive! The world can only be made better by giving and forgiving. I rediscovered the meaning in practicing this truism again this morning. On the street I saw an old lady stumble and fall on the pavement. She was struggling with the weight of several bags that she was carrying. It was a busy morning. I was rushing off to catch up on work. But I flagged down an auto-rickshaw and requested the driver to pick up the lady from across the road and take her to where she would have liked to go. I gave the driver some money and asked him to call me if he had to go a longer distance and pick up any extra cash from me later in the day or tomorrow. The driver, who belongs to the redoubtable, unreasonable and unruly clan of auto-rickshaw drivers that terrorize public transport in India, replied: “Sir, thanks for giving me the opportunity to serve. I will take care of her, wherever she wishes to go. I will make up the difference in fare, if any!” As she rode away in the auto-rickshaw, a strange sense of peace and joy rose within me. I had had a pretty rough morning and much of it was centered around what we didn’t have and magnified by one individual on my team who was making Life miserable for all of us. Yet this one opportunity to serve, in a sublime and sure fashion, made me feel infinitely better. Re-energized and feeling good that I had been useful, despite my circumstances that had made me momentarily bitter with my Life and world, I forgave my colleague for his transgressions. I realized that if I had to behave the same way as he was doing, it would leave both of us scarred. I resolved to give the situation my understanding. It may not change anything in the short term but definitely makes me feel good and useful as I write this. Try this approach to give and to forgive. I guarantee that you will feel the same way as I do. When things get snatched away from you and when you feel betrayed, let down, hurt and pained, the natural response is to protect what’s left with you and to be wary of everything and everyone. But such a restrained existence will only make you hurt more. The first sense of insecurity in us comes from whether we have enough for our own survival. So it is not that we don’t want to give. We do. But what prevents us from giving freely is the fear that what if we needed what we are giving away and we don’t have enough of it! The truth is we will always have enough and be provided whatever we need by the Universe. To be sure, we will never be denied our own needs. So, give and give freely. Without inhibitions and without expectations. 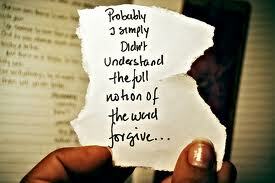 Forgiving too involves giving of a different kind – your understanding, patience and love. If you understand that we are all the product of the time we go through, you will realize that people behave differently from you because of what they are suffering from and going through. If someone is causing you pain, you are perhaps inclined to believe that they are conspiring against you. And your reflex action is to hate them. To want to have nothing to do with them. But if you make a sincere effort, you will realize that their behavior is an expression of the anguish within them. What they need is your understanding, and not your hatred. Forgiving does not mean subscribing to someone’s despicable behavior or forgetting what happened. It means just letting go of all the negative energy that may be pent up within you, by giving the person in question your understanding and being compassionate. 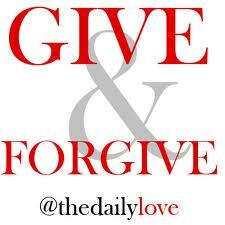 When you give and forgive, especially when you are not expected to, you may well not be recognized or celebrated. But you will discover the joy of being human. Isn’t that a celebration enough in itself? Author AVIS ViswanathanPosted on December 21, 2012 March 14, 2016 Categories Art of Living, Auto-rickshaw, Being Human, Give, Giving, http://schemas.google.com/blogger/2008/kind#post, hurt, Intelligent Living, Joy, Pain, SufferingLeave a comment on To make the world better, give and forgive!